This capital of Bihar and a lineal descendant of the ancient metropolis of Patliputra are located on the confluence of Ganga and Sone rivers.Patna, a modern city, is steeped in legends and mythology. Modern Patna was believed to have been founded by the Afghan ruler Sher Shah Suri after he defeated the Mughal King Humayun. Today Patna is an important business centre of eastern India. 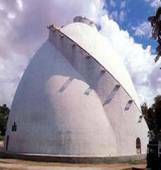 More significantly, it is a gateway to the Buddhist and Jain pilgrim centers of Vaishali, Rajgir, Nalanda, Bodhgaya and Pawapuri. 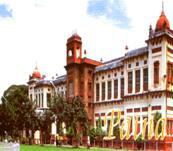 Patna which is the capital of northern state of Bihar is located on the southern bank of the Ganges. Turning over the pages of early Indian history one comes across the name of the pre-eminent city of Patliputra.This city saw the rise and fall of India's first major kingdoms. Its period of glory spanned a thousand years. This later became famous Maurayan metropolis of Patliputra and was ruled by Chandragupta Maurya and his grandson Ashok, acclaimed for the spread of Buddhism. Other emperors who ruled from Patliputra were the Gupta and Pala Kings,Shershah suri and it was ater only Aurangzeb,who reamned it Azeemabad.Vestiges of this ancient city can be seen at Kumhrar,Bhikhnapahari,Agamkuan,Buandi Bag etc.The name Patna is said to have been derived from Patan which happens to be the name of a Hindu Goddess Patan devi. Sonepur Mela is known world over for its cattle fair which is the largest one in the world. This fair takes place at a distance of about 25 Km from Patna and commences on the day of Karthik Purnima, in the month of November. The cattle fair attracts traders from not only India, but other countries in Asia. Apart from elephants, there are cows, horses and camels that are sold here. Held in Gaya in the month of September, the Pitrapaksha Mela attracts people from all over the country. Every person prays god that he be blessed with a son who would offer him pinda daan (lymph of rice) at Gaya. The ‘Pindaadan’ offered here by the relatives of the dead is a must for the ‘moksha’ of the soul. Chatth Puja is major festival celebrated in Bihar. People worship the Sun god and offer prayers. For the people of Bihar, Chhath is the most important festivals and they celebrate it no matter where they are . Birth of Lord Ram is celebrated on this day.This is very popular in Northern India. During the eight days preceding Ram Navami, ramayana is read or chanted. Patna is an important Sikh pilgrimage, being the birth place of the tenth leader, Guru Gobind Singh. 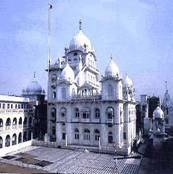 One of the four sacred shrines, the Har Mandir Takht also known as Patna Sahib, is situated here. Built by Maharaja Ranjit Singh, the shrine houses a number of belongings of Guru Gobind Singh and other Sikh saints. Built in 1545 by Mughal emperor Sher Shah Suri to commemorate his reign over the area, the mosque is one of the most impressive landmarks of Patna. Ornate with beautiful architecture, the structure is a typical example of the Afghan architectural style. Built in 1621 by Parvezshah, son of emperor Jahangir, this mosque is also known as Sanji Masjid and the structure is a marvel of architecture. Built of white marble this is actually a Sikh shrine, commissioned by Maharaja Ranjit Singh to commemorate the birth of the last Sikh Guru, Guru Gobind. One can get to see the personal belongings of the guru with special permission. This huge and impressive beehive-shaped structure was constructed in July 1786 by Captain John Garstin following a terrible famine in 1770, to serve as a state granary.Here one gets a fine view of the river Ganga and Patna city. The museum houses metal and stone sculptures of the Maurya and Gupta periods,terracota figurines and archeological finds from different sites in Patna.Among its prized exhibit are ashes of the Buddha,image of Yakshi and a 16 metre long fossilized tree. Life size statues in front of the old secretariat compound have been put up in memory of seven brave young men who faced bullets for the freedom of the country and sacrificed their lives in August 1942 in the historic struggle for India's independence during quit india movement. 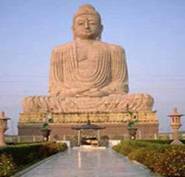 Located 125 kilometers away, Bodh Gaya is a major tourist attraction near Patna. Bodh Gaya was the place where Bautam Buddha attained enlightenment under the peepal tree. Known as the Bodhi Tree, it is one of the most sacred sites for Buddhists across the world. The Bodhi tree is enshrined in a temple called Bodhi Temple. A huge statue of Lord Buddha inside the temple is another major tourist attraction at Bodh Gaya. Bodh Gaya is a part of Buddhist Circuit that connects all the places associated with Buddha and Buddhism. Constructed at the site of Sher Shah's fort,it preserves a rich collection of jade,Chinese paintings and silver filigree of the Mughal period. Located 90 kilometers away from Patna, Nalanda houses the ruins of the famous Nalanda University. Nalanda was once the seat of higher learning but was devastated by a Turkish invader in the twelfth century. Wide spread campus of the university shows the grandeur and versatility of Nalanda University. According to Chinese traveler, Hiuen Tsang, Naland University housed more than ten thousand students and one thousand faculty members. Set up in the turn of the century, the library has a distinguished collection of rare Arabic and Persian manuscripts, Rajput and Mughal paintings and oddities like an inch wide Quran.It is one of the national libraries of India. An old temple built in the Pala period stands on the northern bank of Bawan Pokhar and enshrines beautiful images of several Hindu gods. Site of the aancient city of Pataliputra, lies 5 kms away from Patna railway stationon the Kankarbagh road. Excavations here have revealed relics of four continuous periods from 600BC to 600AD.An important find is the 80 pillared huge hall of the Mauryan dynasty. Situated on the bank of river Ganga, this mosque is known variously as Saif Khans mosque, Chimni Ghat mosque and Sangi Masjid. 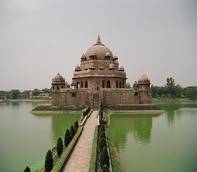 This was built by Nawabs of Patna, it is an example of unique architecture of midlive time with beautiful garden of Mughal style. Shopping in Patna is a very exciting experience and each one of us can enjoy it. Maurya lok is one of the oldest and largest shopping areas of Patna.The shopping list in Patna includes Stone and bead-jewellery, Stone pottery,hand-painted wall hangings, miniatures in paper and leaves, appliqué work on fabric and leather goods.Silk and tussar fabrics are very famous Patna.Different kinds of paper, and high quality bed linens are also added to the list. There are large number of Government Emporia and private shops in Patna which offer good shopping in Bihar.Some of the notable shopping shops include N.P.Centre, Maharaja Kameshwar Complex, Verma Centre, Kulharia complex and Khaitan market. Maurya lok, Patna market and Hathwa market are one of the oldest and largest shopping areas of Patna. Patna being the capital city of Bihar has excellent air connection to many important Indian cities like, Delhi, Mumbai, Kolkata. Several Airlines serve this airport with regular flights. A large number of major and minor places within the state are networked by train services of Indian Railways. Even the state is serviced by important super fast trains like Rajdhani Expressand Shatabdi Express . An extensive road network links Patna to major cities and tourist detonations within Bihar and neighboring states. 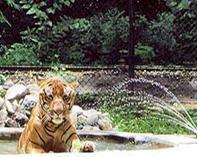 Bodhgaya, Rajgir, Ranchi, Siliguri are conveniently located by road to Patna.